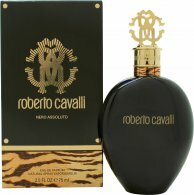 Nero Assoluto by Roberto Cavalli is an oriental woody fragrance for women. Italian for “Pure Black”, Nero Assoluto is a rich and sultry scent with a bright, sleek opening. Notes of orchid and citrus fruits greet you at the top before giving way to the decadent vanilla in the heart. The base is pure seduction with woody notes and ebony. An underrated beauty of a fragrance - sublime, clean and expensive smelling without the high price tag. Nero Assoluto was launched by Roberto Cavalli in 2013.